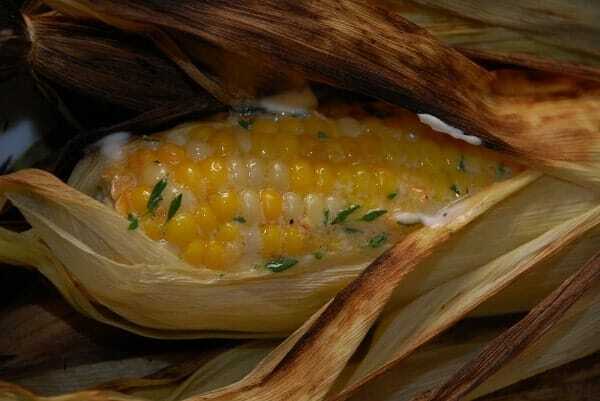 The lemon thyme butter puts a delicious spin on a traditional Grilled Corn on the Cob Recipe, and what a spin it is!! Sweet, buttery, and crisp, it’s hard to feel like you are a Weight Watcher when you are indulging in this. At just 3 Points per serving, it makes a perfect low calorie 4th of July Recipe, or to serve as a tasty and healthy side dish with your family dinner this summer. Not only is it easy to make, but with summer corn on the cob appearing in abundance at your local grocery stores, it’s pretty cheap too. The flavorful butter adds such a nice culinary touch to such a popular recipe. It’s something everyone will love, but something you can enjoy, guilt free. Impress your summer BBQ guests this season with this delicious Grilled Corn on the Cob with Lemon Thyme Butter Recipe! At just 3 Points per serving, it’s a fabulous side dish recipe that no one will believe is a Weight Watchers Recipe. In a small bowl, combine the butter, thyme, lemon zest and salt & pepper. Fold down the husks of the corn, without removing them, and peel off the corn silk. Then fold the husks back up. Grill the corn on the grill rack, turning several times, until the corn is tender and a little charred. About 10 minutes. Serve the corn with or without the husks, with lemon-thyme butter on the side. I butter the corn before I pull the husks back up, and then I tie a string around the cob to hold it all together and then I BBQ them. So yummy! !